COLOR(S):Black, brown, tan, white, sable, and golden. With or without other colored markings. 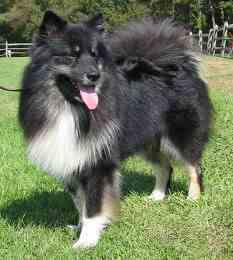 Bearing high resemblance to the Samoyed and Keeshond, the Finnish Lapphund is one of two versions of the same breed. The general breed, the Lapphund, originally existed in in Scandinavia, then trickled down to both Sweden and Finland. To avoid confusion with the name, both countries simply named the same dog after their own country. Thus exists the Finnish Lapphund and the Swedish Lapphund, varying only slightly in size. The Finnish Lapphund is a medium sized dog that is compact and well built. They are covered with a bushy double coat that can protect against the most severe Finnish weather. Their tails come up over the back and curl, and they can be of any color. Finnish Lapphunds are known to have a distinct marking sometimes appearing around the eyes known as "spectacles". A small circle of fur around the eyes is colored lighter than the rest of the fur, creating the appearance of glasses. They have a foxy-type muzzle, profuse fur and short triangular ears. Finnish Lapphunds are very friendly, weather-resistant and naturally good at alarming their masters, as they bark at unusual occurrences. They have more recently become family pets due to their friendly nature, but were once used for reindeer herding. They have a natural instinct to herd, although this trait has diminished with lack of use. Finnish Lapphunds are intelligent, trainable and enjoy a cool climate. Pleasant and obedient, the Finnish Lapphund makes an excellent companion or herding dog. Finnish Lapphunds are friendly, intelligent and vocal. They like to bark at unusual things, making them an ideal watch dog. They have an instinct to herd, although it may be more diminished than it used to be. They are said to "think before they act", taking time to think before they obey. They are quiet obedient, however, and highly trainable. They can sometimes be stubborn, and highly enjoy the cold outdoors. Finnish Lapphunds are courageous, brave and affectionate. They are lively, agile, wary of strangers, and energetic. They love the affection of their owners, and often have a sense of humor in their exuberance. They can be independent, and should be trained from the moment they are brought home. Regular brushing is required for their bushy coat, but for such a large coat the care is only moderate. For a long haired dog, they are generally low-maintenance. Although a relatively healthy breed, the Finnish Lapphund may suffer from GPRA (Generalized Progressive Retinal Atrophy), as well as cataracts. They should receive plenty of exercise, however, as they are an active breed. They will often receive adequate exercise simply from running around the house as a puppy. Finnish Lapphunds are very trainable. They obey, but may be stubborn at times. They should be socialized from an early age, and firm training should be initiated as they will do what they want if not instructed. Training must remain interesting for this breed or else it will lose interest and disobey.